Combine all ingredients except berries and mix well. Add enough flour so that the mixture is easily manageable I.e not sticky. Press 2/3rds of the mixture into a small ramekin. Form into a pie crust shape. Add your berries (if using frozen, be sure to thaw first). 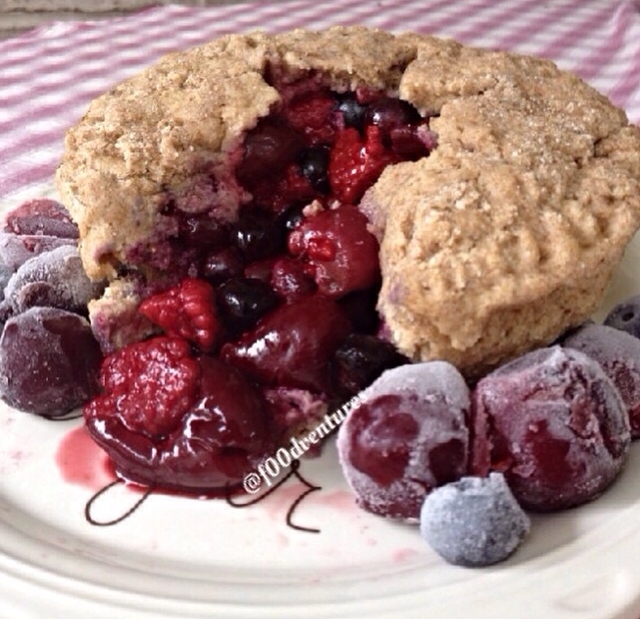 Roll out the rest of your â€œcrustâ€ and place on top of the berries. cut an "x" in the center then,using a fork, press the top crust into the bottom crust. Microwave ~2-3 minutes or until crust is fully cooked. Pro tip: put a plate underneath your bowl while cooking to catch the juice from the berries in case it starts to overflow. Let cool before enjoying!